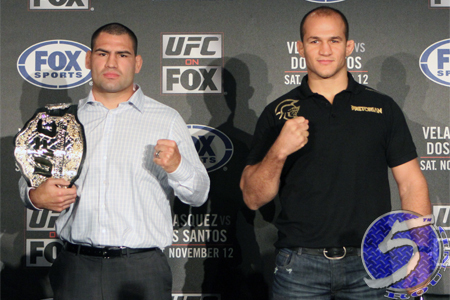 UFC president Dana White has repeatedly dubbed Saturday’s scrap between heavyweight champion Cain Velasquez and Junior dos Santos (both pictured) as “the biggest trilogy in MMA history.” But of course, what else do you expect a promoter to say? Every upcoming fight is the biggest in the history of ever. However, given the lack of media attention and buzz surrounding the rubber match, it seems as though this steak is missing its sizzle. Is it because both fighters are from the old school and refuse to smack talk each other leading up to UFC 166? Is it because Velasquez dominated dos Santos so badly in December’s rematch that pundits don’t believe “Cigano” could have made the required adjustments in 10 months to avenge the most humiliating loss of his career? Would the trilogy be generating more hoopla if the results from the first two tangos happened in reverse order – Velasquez dominating the Brazilian, then dos Santos bouncing back to post a 64 second KO in the sequel? What if Velasquez wasn’t more than a 2-1 odds-on favorite to take the lead in their rivalry? Speaking of betting odds, despite having numerous intriguing matchups on the card, most of the lines are one-sided so the Gambling Gods don’t expect many of the fights to be too competitive. Is that a factor? There’s no denying big talent with even bigger names will be in Houston on Saturday, but there seems to be something missing from this show. Maybe tonight’s final installment of “Primetime” will officially set the hype train in motion. An ultra intense face-off between Velasquez and dos Santos at Friday’s weigh-ins could certainly help, too. Regardless, the curtain will be drawn on UFC 166 in just three days. Will you pay $54.95 to watch?